PAI-GOW POKER is COMING SOON! --TO iPHONES, iPADS, & iPODS (TOUCH)!! CLICK THE FOX --TO ENTER FOX CASINO! EXCITING VIDEO POKER GAME APPS -AVAILABLE SOON ON iPHONE & iPAD! A NEW iPAD & iPHONE GAME! “T' HOLD'EM” is the hottest, fastest way to play poker with video opponents! This "winning" version of "Texas Hold'em" is a game: where you can test your skill to beat video opponents. "T' HOLD'EM" closely follows the "traditional" table version, but it's more fun -because it's faster! You are in the "driver's seat", and you can decide when to "bet big" or when to "fold'em". This game of T'HOLD'EM" is unique, because you are in charge of every "action"! --Like the child's game: "Simon Says", the other video-opponent-players will simply copy you! With two main buttons; you can "bet" if you like your hand or "fold" whenever you want. You do not have to worry about raising or bluffing the video opponents (which can slow "typical" video poker games down). If you like to be in charge of a fast-action game --then this is the game for you! This game of T'HOLD'EM is a computerized version of traditional "Texas Hold'em", which has captured the poker mystique. It has the feeling of playing "real" poker, while remaining exceptionally simple to play. Besides having video opponents, the players have the choice of folding at any time when they "feel" that their hand may lose. Our T' HOLD'EM keeps people loyal to the game: When people win, just like at the tables, they can win BIG! Check out the Card Player Magazine Cover (see link), where they featured our “Texas Hold’em” (our slot-machine-version of the game)! In fact, the Card Player is a magazine that’s traditionally for poker players who play at the tables. We felt honored when we found out that we had the first poker slot machines –ever featured on Card Player’s cover! Our Texas Hold’em Game was the “Texas” video poker slot-machine-game, played by World Champion Poker Players (like Johnny Chan) at Binion's Horseshoe in Las Vegas –and all around the world! 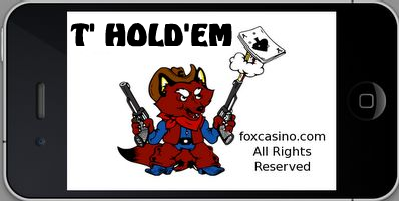 CLICK HERE --TO PLAY T-HOLDEM NOW!